We always warn clients to beware of scammers, who find out details of new trade mark applications and use them to send fake invoices for trade mark fees. We recently found ourselves on the receiving end of this type of scam! 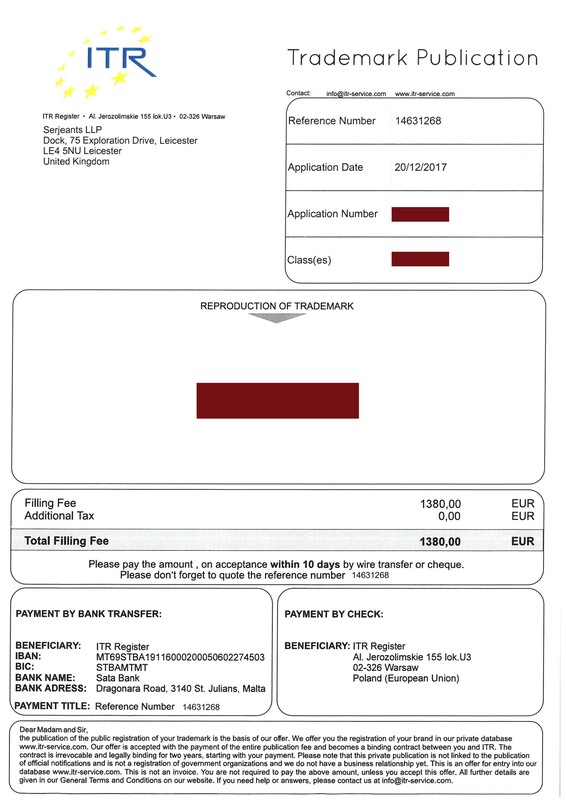 Serjeants filed an EU trade mark application in our own name and a month later we received a demand to pay €1380 to the ITR Register. The demand (pictured here) is nicely laid out and the logo with a circle of stars looks official but beware of the small print. It says, “This is not an invoice” and “We offer you the registration of your brand in our private database”. In other words, if you send money you get nothing of value in return. These scams must be profitable because the website of the (genuine) EU Intellectual Property Office lists 110 different examples of misleading invoices to assist people in identifying fraudulent ones. Click here to view the examples. The authorities have found it difficult to crack down on trade mark scammers because of the way they work across international borders; in our example, the UK, Poland and Malta. However, we were pleased to see that a court in Sweden recently convicted 20 perpetrators of fraud and sent four of them to prison, so perhaps the tide will now start to turn. Firstly, do not pay it until you are confident it is genuine! We know that some clients have been caught out so please make sure your accounts department is aware of the problem and do check with us if you have any doubt. If the invoice turns out to be fake you should just throw it in the bin. If you are feeling public-spirited and your example does not already appear on the EUIPO list, you could submit a copy via this link. You could also report the scam through the UK’s Action Fraud website: https://www.actionfraud.police.uk/report_fraud. If you think you may have a been a victim of trade mark scammers and would like advice about what to do next, please speak to one of our expert trade mark attorneys on 0116 233 2626.